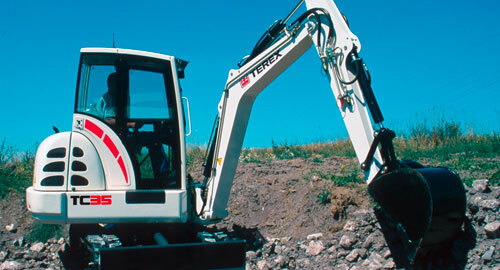 Ideal for ground levelling, backfilling, grading and contouring, the 23-hp Terex® TC29 compact crawler excavator offers operators an offset boom with built-in swing that provides not only excellent visibility but also multi-width excavation and parallel-to-wall operation. This unit is designed with a 56-in wide dozer blade that is independently controlled form the track drive for uninterrupted operation. Smooth, simultaneous machine operation is achieved on the TC29 excavator due to its axial piston, variable displacement hydraulic pump and motor design. This unit’s solid tractive force boosts the operator’s ability to get the work done more quickly quickly, while the twin door cab allows for ease of access and excellent ventilation for maximum operator productivity. Fingertip controls (electro proportional) on right joystick, actuation via rollers, come standard on the TC29 excavator for additional control circuit for work attachments. This system also includes a second additional control circuit on left joystick, actuation via rollers. 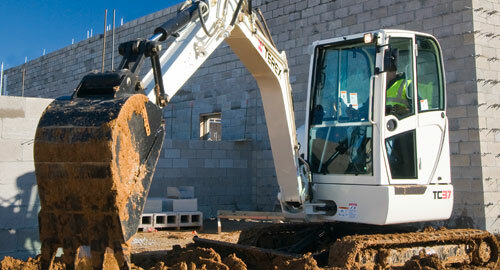 The TC29 excavator can be outfitted with a quick-coupler system (mechanical or hydraulic) to connect to work attachments, including standard buckets, ditch-cleaning buckets, augers, hydraulic hammers and cutting units, quickly. 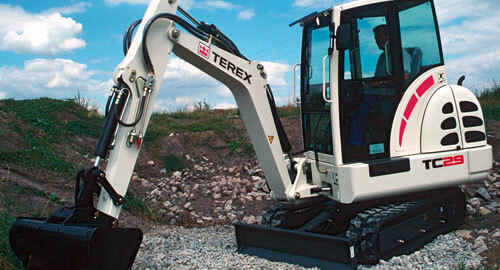 The hydraulic quick-coupler system allows operator to change tools without leaving the cab. The location of the top-mounted cylinders protects the cylinders from damage during loading and transporting materials. 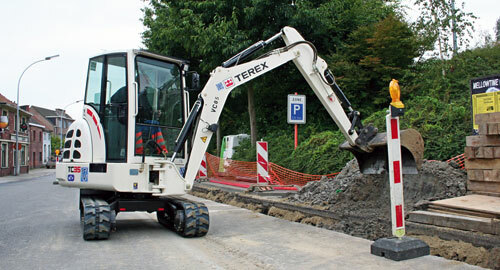 The Terex® TC35 compact crawler excavator offers operators smooth, simultaneous operation with axial piston, variable displacement hydraulic pumps and motors that provide load-sensing and load independent flow division (LUDV) hydraulics. An auxiliary hydraulic circuit with open (pressureless) return provides flexibility in adding attachments. It comes standard with pin-on buckets and J.I.C. hydraulic hose fittings. The offset boom design with built-in swing gives operators excellent visibility as well as the ability for multi-width excavation and parallel-to-wall operation. 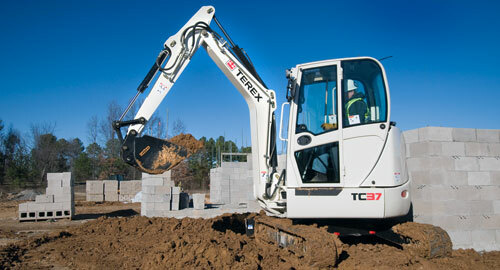 The TC35 compact excavator offers an enhanced design for greater digging performance. 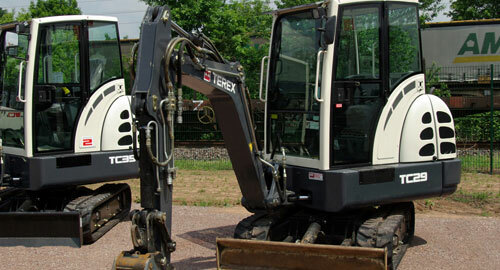 For example, this unit is equipped with a larger, longer counterweight provides increased balance and lift capacity. With its offset boom design and Knickmatik® boom solution, operators can perform tasks with this unit within the most confined construction sites. The Knickmatik cylinder is purposely positioned to protect against damage from collisions. The offset boom can move to either side at full digging depth. 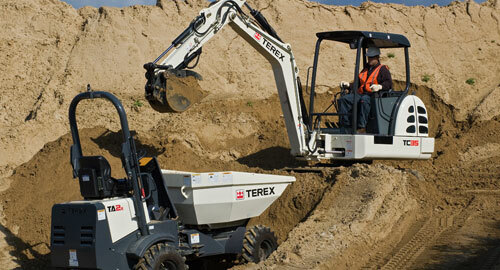 This feature allows TC35 operators to work alongside walls, existing infrastructure, hedges or embankments. The total articulation of the Knickmatik solution is 120 degrees. 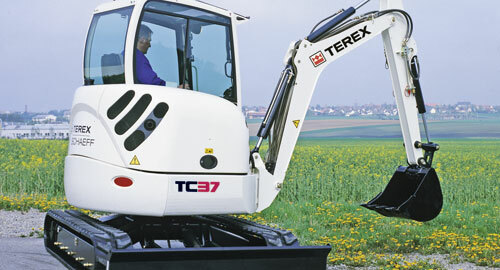 Weighing in at 7,870 lb, the TC37 model offers a maximum digging depth of 10 ft 6 in and a reach of 18 ft 1 in. The 30-hp Mitsubishi 4-cylinder diesel engine and hydrostatic drive delivers the speed and power needed to dig, load, lift and place material. All of the cylinders on the TC37 excavator are mounted with spherical, self-lining bearings so that less stress is transmitted to the pins or bushings. Add load-sensing hydraulics with variable displacement piston pumps and closed center, flow compensating valves and operators have a high efficiency, low fuel consumption operation. Plus, the TC37 features an optional quick change hitch that allows a wide range of optional attachments and accessories to be used for even greater versatility. A spacious cab with exceptional visibility in all directions keep operators focused and productive. The cab features a fabric-covered hydraulically cushioned driver’s seat that adjusts to the operator’s height, weight and length, plus height-adjustable armrests. 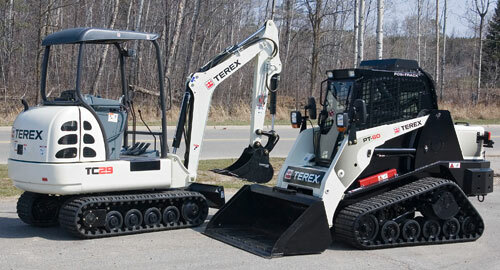 Two power touch, pilot operated four-way control levers make for nearly effortless operation. And the control pattern changer (standard) is out in the open and doesn’t require a wrench to make adjustments.